Mr. Breitschopf presented the new edited title "Lilli Langhals", illustrated by Susi Mair-Weigel. The duration of the exposition was prolonged until the 23rd of January 2011. 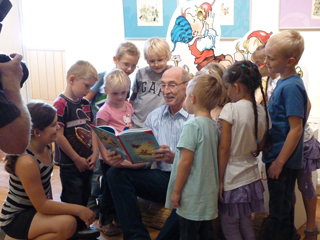 Sixtythree years ago, the bookseller Julius Breitschopf founded a publishing house for children’s and young peoples’ books. Since then, there’s been a lot of change within the company, but one thing has stayed the same: the name. His son, Julius Peter Breitschopf, has been successfully directing the publishing house for the past 38 years. 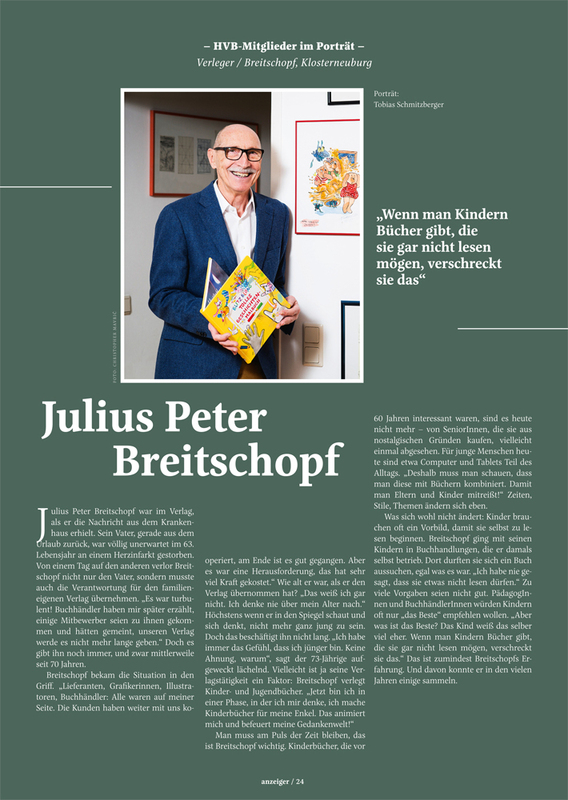 “Everything that’s fun and enjoyable for children, and that helps them develop”, that’s how Julius Peter Breitschopf describes his publishing philosophy. Exactly sixtythree years ago to this day, his father, a bookseller, was granted his trade license. In the beginning, they published children’s and young peoples’ literature, more by coincidence than by calculation. “It was a case of the right people being in the right place at the right time.” Since then, Breitschopf publishers have worked up an impressive backlist. Not even the boss himself knows exactly how many titles have accumulated over the decades, through the purchase of Paka/ Heide/Mühlehner Publishers (1965). But sometimes Breitschopf pulls an old title out of the archive, and adapts its content and form to contemporary times, and brings it out on the market again, without disowning the original. The challenge grew. As his father died suddenly of a heart attack in 1972, Breitschopf had to take over at the helm, breaking off his studies in international trade. “I had to prove myself in this new leading position. Some people had already declared the publishing house for dead.” He expanded, and modernized the program. To meet the requirements of the market, Breitschopf went in search of entrepreneurial synergies; the path to an eventual partnership was preprogrammed. In 1985 came the merger with Hölder Pichler Tempsky. “Our work together developed well. 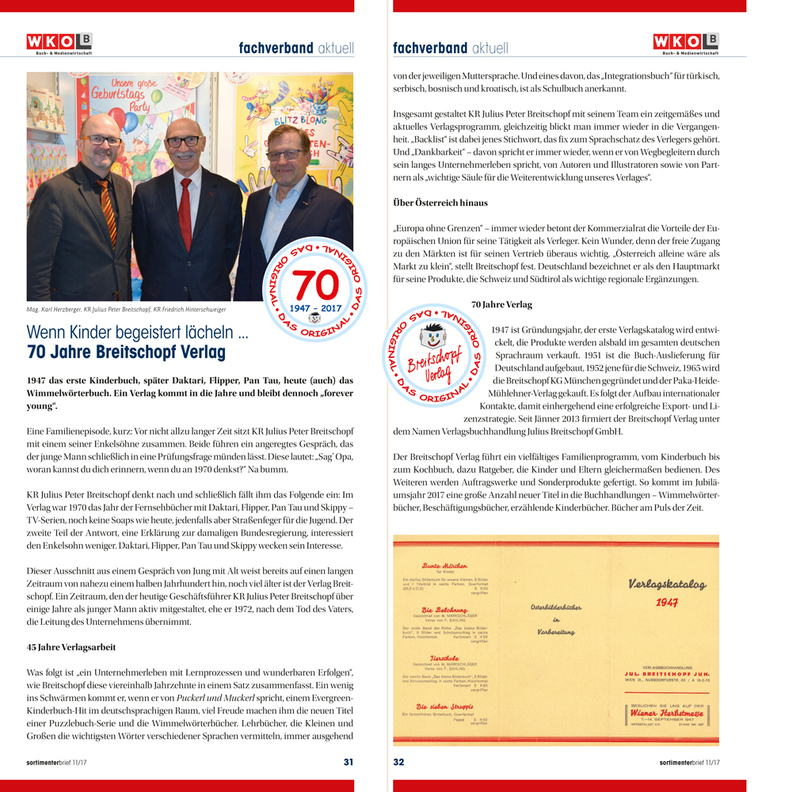 We received many prestigious awards, and also sold well in Germany. Those were great times.” However, after 13 years, the association disbanded. How should it continue now? Breitschopf was faced with the decision to either reconstruct a classic publishing house with agents and distribution, or alternatively, for practical and organizational reasons, to intensify contacts to major customers, and to supply to department store chains, mail order firms, and to supply the industry with special commissioned work. Every year, many new books emerge from the “publishing workshop” to enhance the extensive family program. 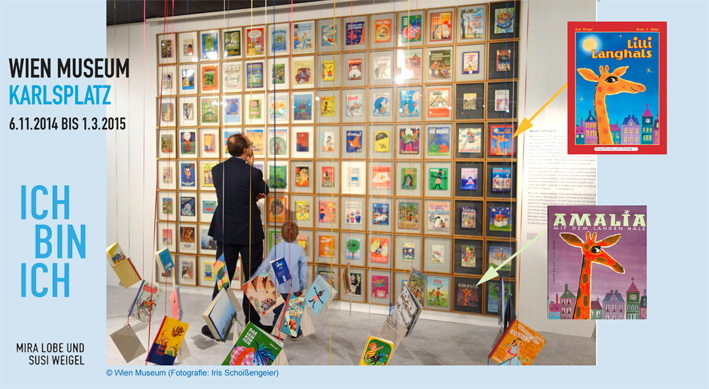 Breitschopf says “But the old picture books are also a blessing for the company, and for some of our customers, a reminiscence of their own past. 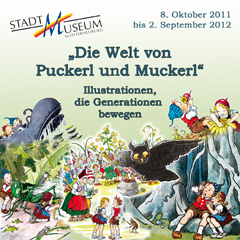 Who doesn’t know ‘Puckerl and Muckerl’ by Hilde Forster, illustrated by Ernst Kutzer!” Today, along side the children’s and youth program, you can find cookbooks and herbal books, historical novels, greeting cards, audiocassettes and CDs, puzzles, painting books, and cuddly toys on offer. The picture book with the newly developed spiral binding passes the test that Julius Breitschopf (right) and G. Rydlo put it to.